Last night we took Katie out on a "family date night." We went to dinner at In-N-Out and then to see a Christmas puppet show. We had so much fun together! Bill and Katie are my Lovey-Loves forever. 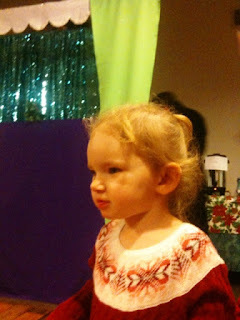 Katie looks at the rest of the audience while waiting for the puppet show to begin. Katie and Daddy in the audience. Katie particularly loved the jumping mice and the talking snowman! She seemed to enjoy herself, and we did, too! After the puppet show, "Santa" arrived. Katie thought he looked like a "fake Santa" and so she didn't want to sit with him. 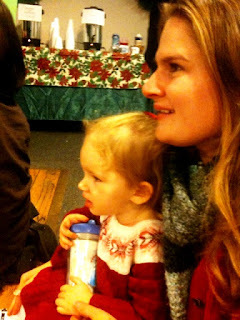 Katie thinks some Santas look real and some look fake. It is interesting... She was skeptical of this one, and rightly so: some of his extra belly stuffing was falling out a bit. She watched the children sit on his lap, and I asked her if she wanted to, but she didn't. Eventually she said she wanted to go home. Later, she wanted to talk with me about the little boy who cried when his mommy made him sit on Santa... I promised I would never do that to her, that it would always be her choice. She is a very reflective little person: I love her so much!